avoid a similar error in the future. This paper contains my best understanding of why tens of millions of people voted for Donald Trump, the majority of whom still support him. It is in the form of a refereed journal article of the kind I used to write when I was teaching strategic decision making. However, this paper is not an academic article but an advocacy piece. I begin with the assumption that the election of Donald Trump was a collective decision error. Throughout the paper I freely state my views in a way that would be inappropriate for the journals in which I used to publish. The factors that contributed to the Trump election can be divided into three categories, political processes, organizational processes, and cognitive processes, including biases and heuristics. Political processes include political polarization, the Republican Primary debates, and Russian cyber-espionage. Organizational processes include the Great Recession, Trump’s “Apprentice” television programs, and media coverage of Trump. Biases include confirmation bias, anchoring bias, and biased assimilation. Heuristics include representativeness, availability, and stereotyping. Cognitive processes include framing, identification, escalating commitment, groupthink, backfire effects, and dissonance reduction. I focus on cognitive processes and discusses the ways political and organizational processes influenced them. I conclude with a discussion of whether or not it is possible to improve our collective decisions and avoid electing someone even worse than Trump in the future. Donald Trump’s election was an error in collective judgment. Sixty-two million people individually voted for him which means this was a very large and costly collective decision error. 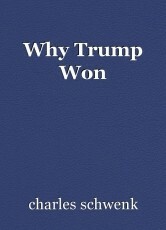 This piece deals with two basic questions, “Why did we elect President Trump?” and “How can we prevent future Trumps?” I first lay out the stages of the process that led to Trump’s election. Next, I describe the political, organizational and cognitive factors that shaped the decision. I conclude with a discussion of whether there is anything we citizens can do to improve political decision-making so that we will not elect an even worse person for President in the future. To answer the first question, it is best to focus on a subset of the 62,000,000 people who voted for Trump, the most committed Trump supporters. Some people voted for him because they believed he was the lesser of two evils or because they hoped he would do some of the things he promised in the campaign. The most committed supporters decided early that they wanted Trump and deepened their identification with and commitment to him during the campaign. As he continues to govern capriciously and incompetently the less committed Trump voters will cease to support him but a core of supporters whose faith is unshakable will remain. This piece focuses on cognitive heuristics, biases, and processes and describes the ways political and organizational processes influenced them. Since Donald Trump began to lead the polls in the Republican primary, there has been a steady stream of articles about cognitive heuristics and biases that may have influenced his supporters commitment to him. These have appeared in popular, non-specialist sources as diverse as Fortune (Pfeffer, 2015), Psychology Today (Veissierre, 2016), The New Yorker, (Konnikova, 2016), and Cosmopolitan, (Schreiber, 2016). I will discuss 12 cognitive processes, heuristics and biases and describe the ways multiple biases may have interacted at different stages of the decision process. It will also show how political and organizational processes affected specific heuristics, processes and biases. In describing the cognitive processes that contributed to the Trump error, the author will draw on two areas of research, behavioral economics and social identity theory. Some researchers prefer other terms for both of these areas of inquiry. Daniel Kahneman, one of the most influential researchers in behavioral economics, prefers the term “judgment and decision-making research” (see Kahneman, 2011). Many prefer the term “self and identity” to the term social identity theory. There is now a Society for Self and Identity and several Handbooks of Self and Identity have been published (see for example, Leary & Tangney, 2003 and Schwartz, Luyckx, & Vignioles, 2011). Whatever terms are used, both areas of research are necessary to understand the Trump mistake. The research on social identity or self and identity helps us understand the biases identified in the behavioral economics or judgment and decision-making area, many of which can be exacerbated by excessive identification with a group, political party, or political candidate. The behavioral economics research, in turn, can shed light on how we adopt dysfunctional identities or self-definitions. Important public and business policy decisions are the result of sequential processes. It is useful to divide them into stages. However, it is important to remember that the actual processes are very fluid and that activities occurring in one stage are influenced by activities in prior stages and affect actions taken in subsequent stages. Nonetheless, dividing the decision into stages allows us to highlight the activities that are most significant in each stage. With these considerations and caveats in mind, the author has identified three main stages. STAGE 1, the beginning of the decision process, was when Trump formally announced that he would run for the office of President. Of course, a great deal happened before this including Trump’s electioneering before his formal announcement, his business activities, and the worsening political polarization of the electorate. Based on this information Republican voters formed their initial views about whether Trump would be an acceptable candidate. STAGE 2 involved Trump’s successful quest to become the Republican nominee. Here, Republican voters evaluated him against the other candidates during the Republican Primary debates and developed commitment to him. STAGE 3 involved the contest between Trump and Hillary Clinton. At the end of this process, 62,000,000 individuals decided that Trump would make a better President than Clinton. The table is based on a model for explaining decision processes and errors that divides explanations into three categories, political processes, organizational processes, and cognitive processes (Schwenk, 1988). This model is based on the work of Graham Allison (1971) who proposed three basic perspectives in a study of the Cuban Missile Crisis. When we explain a decision error in terms of political processes, we use the metaphor of a battle, and examine the interactions between partisans of different political or ideological perspectives. When we explain the decision in terms of organizational processes, we use the metaphor of a machine and look at the organizational processes that may have produced a decision that seemed rational at each stage but was finally shown to be an error. When we focus on the decision as an intendedly rational outcome of flawed cognitive processes, we attempt to identify those processes and understand how they were influenced by political and organizational processes. The processes listed in each cell of the table do not operate only in a single decision stage but continue through the later stages. The political process of polarization, for example, was present during all the stages and became more intense over time as new cognitive and organizational processes came into play. The remainder of the paper will elaborate upon the concepts listed in each cell of the table. Political Processes: Polarizing Conflict. The social process that created the political context in which Trump entered the Presidential race can be summarized in one word, “Polarization.” Political polarization is a serious and worsening problem for our democracy. It is important to understand the nature of this polarization and the ways it affects information processing and decision-making. Political polarization increased dramatically during the Bush and Obama presidencies (Pew Research Center, 2012). The most worrying aspect of this increasing partisanship is that partisans’ negative views of their opponents have increased (Abramowitz & Webster, 2016). Both Republicans and Democrats have become more extreme in their views during the last two decades, though there are differences in the ways they express this polarization. Pew research data shows that from 1994 to 2014, the proportion of Democrats who expressed liberal views on most or all of the survey questions increased from 30% to 56%. The share who indicated they were consistently liberal increased from 5% to 23%. The proportion of Republicans who expressed conservative views on most of the survey questions increased from 45% to 53% and the share of those who were consistently conservative increased from 13% to 20% (Pew Research Center, June 12, 2014). The absolute amount of change among Republicans has been smaller than among Democrats and the pattern was different. Between 1994 and 2004 the average Republican moved substantially toward the center ideologically but from 2004 to 2014 Republicans moved back toward the right at a rate that exceeded the rate at which Democrats have become more liberal (Pew Research Center, June 12, 2014). This paper will focus on polarization among Republicans because they are the ones who elected Donald Trump. The Republican Party has sought to strengthen the commitment of its base by attacking liberalism in general and the Democratic Party in particular. Though this statement will seem extreme and partisan to some it is borne out by historical facts. A concise and compelling summary of these facts is provided in two books by Thomas Mann and Robert Ornstein (2006, 2016). Republican leaders did not deny their strategy but openly stated it, as when Senate Majority Leader Mitch McConnell stated that the Republicans’ main objective was to make Obama a one-term President. On a number of important policy questions there has been more movement in Republicans’ opinions than Democrats’ opinions (Pew Research Center, June 4, 2012). One example has to do with opinions on environmental protection. One statement in Pew surveys is, “We need stricter laws to protect the environment.” In 1992, 93% of Democrats and 86% of Republicans agreed. In 2012, 93% of Democrats still agreed but only 47% of Republicans did so. Mitchel, Gottfried, Kiley and Matsa (2014) examined the difference in media habits between self-identified consistent conservatives and consistent liberals and found differences in their use of news media. Forty-seven percent of the consistent conservatives relied mainly on a single news source, Fox News. The most viewed news sources for consistent liberals were more diverse and included CNN (15%), NPR (13%), MSNBC (12%), and the New York Times (10%). Differences in media habits, increased polarization of views, and deliberate strategies by political elites created a situation in which members of both parties were increasingly suspicious of those on the other side. These conditions make polarizing conflict all but inevitable. Polarized debates involve a kind of conflict that becomes more heated and less productive over time. Opponents forcefully state and re-state their own positions, ridicule those who oppose them, and become less able to really communicate with or even understand the other side. We become entrapped in polarizing conflict because our identities are bound up in our beliefs and assumptions about crucial social issues. When others disagree with us our identities are threatened and we re-state our own views more loudly and forcefully. Thus, polarization becomes a kind of downward spiral of misunderstanding and hostility sometimes ending in violent conflict which both sides come to see as the only possible way to deal with the polarization (Schwenk, 2002, pp. 73-92). Polarizing conflict between groups has been studied for many decades (e.g. Meyers & Lamm, 1976) and researchers have identified the conditions that exacerbate it. Peter Coleman and J. K. Lowe (2007) studied polarizing conflict between Israelis and Palestinians and found here are at least five conditions that intensify it. The first is the current conflict climate. If the perceived level of threat from opponents is high, polarization is more likely. Highly publicized confrontations and extremist acts intensify the perception of threats and contribute to an environment of fear and mistrust. The second social condition that worsens polarization is the frustration of basic human needs. In the case of the Israelis and Palestinians, each side feels the other is depriving them of their rights to satisfy basic needs like the need for safety and the need to control their own lives. Many Trump supporters feel that career politicians have no interest in meeting their needs. The third factor includes developmental influences like parental and family modeling, schooling, and the media. Individuals who are raised in families that are enmeshed in polarizing conflicts are very likely to be caught up in these conflicts themselves. Their parents will instruct them to be suspicious and fearful of members of the out group and will display fear and hatred which their children will emulate. The media, by focusing on critical conflict events and extremist acts, and by portraying debates like sporting events, emphasizing winners and losers, reinforces the perception that polarizing conflict is inevitable. The fourth factor has to do with the type of contact between the groups. We are all familiar with the screaming matches, name-calling, and other childish behaviors that characterize much of what passes for political discourse these days. At the risk of stating the obvious, destructive forms of engagement with out-group members polarize conflicts just as constructive engagement reduces it. If we only encounter our opponents in polarized confrontations, as in many encounters between Trump supporters and opponents, our negative views of them will be reinforced. Finally, polarizing conflict is more likely if people feel their opponents have all the power in the conflict. If members of both sides have some power and some control over outcomes in the debate, they are more likely to attempt to understand and cooperate with the other side to achieve a resolution to the conflict that will benefit both sides. A sense of historical victimization is related to the feeling of powerlessness. Many Trump supporters reported that they felt like powerless victims of a liberal government. If we feel our opponents have always victimized us and have gotten away with it, we are more likely to hate them, and this hatred increases polarization (Coleman & Lowe, 2007). information may widen the divide between the two sides. This topic will be discussed later under the heading of biased assimilation. Organizational Processes: The Financial Crisis and Great Recession. The Financial Crisis of 2007-2008 began with problems in the subprime mortgage market and reached its most serious point with the collapse of Lehman Brothers in September of 2008. The Great Recession in the United States officially lasted for the 12-month period from the third quarter of 2008 through the second quarter of 2009. The recovery, unfortunately, has been agonizingly slow. Since the Great Recession many Republicans and Democrats have believed that politicians in both parties bailed out people who invested foolishly and recklessly, from investment bankers to homeowners, at the expense of those who behaved prodently and sensibly. They feel the politicians who supported the Troubled Asset Relief Program created a moral hazard by essentially rewarding imprudent and reckless behavior. The Tea Party formed in 2009 in response to the creation of a number of programs to give relief to homeowners. Occupy Wall Street started in 2011 in response to the fact that Wall Street bankers whose firms had been rescued by the government granted themselves large pay increases which highlighted the problem of increasing income inequality. Many voters wanted to elect a President who was not part of the Washington establishment and Trump was able to make the case that he was more of a political outsider than the other candidates. Trump’s statements were very appealing to disaffected Republicans and the manner in which he delivered them helped distract his supporters from his personal history and the character flaws which render him unfit to serve as President. Many business executives have used vivid and memorable statements in a similar way to convince investors to support their strategies. For example, Bateman and Schwenk demonstrated the use of this tactic by John DeLorean in the creation of the DeLorean Motor Company (Bateman & Schwenk, 1987; Schwenk, 1986). Media Effects: The Apprentice. Trump began the presidential race with a persona developed and honed on the reality television shows “The Apprentice” and “Celebrity Apprentice.” His persona on “The Apprentice” was of a man who was tough but fair, straightforward, and expressed himself in clear, simple ideas. One of the reasons people distrusted career politicians like Hillary Clinton and many of Trump’s Republican primary opponents was because they seemed indirect and gave the impression they were not communicating the whole truth straightforwardly. A SurveyUSA poll conducted in February, 2016 showed that Trump was preferred to Clinton by 28% among regular watchers of The Apprentice but only by 15% among those who rarely watched the show (SurveyUSA, January, 2016). When the Republican primaries began Trump had the highest name recognition of any candidate, with 92% of respondents knowing who he is (Gallup Organization, 2015). This can be attributed to “The Apprentice” and his other publicity-seeking activities. Cognitive Processes: Framing. The way a question is phrased or the way information is presented influences peoples’ responses to it. Tversky & Kahneman conducted pioneering research which helped elucidate the specific effects of framing on peoples’ economic, political, and personal choices (Kahneman & Tversky, 1979; Thaler, Tversky, Kahneman, & Schwartz, 1997; Tversky & Kahneman, 1981). Subsequent research on the framing effect has generally supported and expanded upon Tversky & Kahneman’s original work (Druckman, 2001). One area in which framing effects are most obvious is political polling. Those wishing to make it appear that the public supports a particular politician or public policy can phrase their survey questions to elicit the desired responses. The wording of the questions create a frame in respondents’ minds that influences how they interpret them. For example, we are less likely to support tax increases for infrastructure repairs if they are framed in terms of the money we will lose in taxes than if they are framed in terms of the benefits the repairs will produce. Kahneman also argued that the way we frame a choice affects how we react to information about it (Kahneman, 2011, pp. 363-374). Trump used framing in two ways. First, he framed himself positively and second, he framed America negatively. Positive and negative framing worked together to convince supporters he was the best person to govern the country. Regarding positive framing, Trump’s “Apprentice” persona operated on supporters’ perceptions in a way that was similar to the way the phrasing of survey questions operates. It provided a positive frame for his behavior during the campaign and helped his supporters to believe that despite his objectionable behavior he was a competent, honest businessman who would use his business skills to govern our country more effectively than career politicians could. Regarding negative framing, if we frame decisions in terms of losses and the need to recover from them, we may be willing to take more risks and exert more effort to recover than we would be willing to take to simply improve our current situation (Kahneman & Tversky, 1979). This is a central idea in Prospect Theory, developed by Amos Tversky and Nobel Laureate Daniel Kahneman. Framing in terms of loss increases risk propensity (Tversky & Kahneman, 1981; Druckman, 2001; Thaler, Kahneman, & Schwartz, 1997). As part of this process, it makes people less critical in their judgments of the person offering a solution. Trump used the negative framing effect when he chose his slogan, “Make America Great Again.” Consider this slogan against an alternative, “Make America Greater.” Both specify the same objective but they convey very different contexts or frames. Trump’s slogan implies that America has lost its greatness and needs to recover it. The alternative phrasing suggests that America is already great and we can make it even greater. It is not intuitively obvious that a candidate could win the hearts of Republican voters by saying America is not currently great. Nonetheless, Trump did just that, and the framing effect may help explain why it worked. Not all Republicans accept, as an article of faith, that America IS great. Many recognize the gap between the world of the political elites and the world of their own experience. Trump was able to give voice to their resentment and sense of loss. Trump’s use of both positive and negative framing helped make his supporters very unhappy and eager to embrace a candidate who could reverse America’s perceived decline. A Pew poll conducted in October of 2016 showed that many Trump supporters were in a sad and even desperate frame of mind. Nineteen percent of Clinton supporters agreed with the statement, “Life is worse than it was 50 years ago for people like me,” but 81% of Trump supporters agreed, and they believe foreigners are one of the reasons. Seventy-two percent of Clinton supporters agreed with the statement, “Increased ethnic diversity makes America a better place to live,” while only 40% of Trump supporters did. Trump supporters believe illegal immigrants are criminals who steal our property and our jobs. Seventy-nine percent want a wall along the border with Mexico while only 10% of Clinton supporters want one. Finally, Trump supporters want America to reduce its participation in international trade. Sixty-eight percent of Trump supporters agreed with the statement, “Free trade agreements have hurt America, me, and my family,” but only 32% of Clinton supporters agreed (Pew Research Center, 2016). Bob is intelligent and good at math. He enjoys science fiction and has been interested in studying the stars since he was a boy. What is his profession? Since there are 2.4 million customer service representatives, 2.7 million registered nurses and only about 7 thousand professional astronomers in America, answers A and C are more likely to be correct than answer B. If readers were tempted to answer “B” it was because they allowed vivid statements to distract them from pallid statistical details that are actually more diagnostic. Subsequent research has demonstrated a wide range of mistakes in judgment that result from this heuristic (Koehler, 1996; Nisbett & Ross, 1980). Cunning individuals sometimes flood us with vivid statements and vivid information to sell us a desirable image of themselves. Bateman & Schwenk (1987) and Schwenk (1986) described how the automobile executive John DeLorean used the same tactics to convince investors to back his plans to mass produce and market the DeLorean automobile despite the fact that it was far too expensive for the mass market and that it was virtually impossible for a start-up company to compete with the major automobile companies. Trump presented vivid anecdotal information and misinformation about himself and used vivid slogans like “Drain the Swamp” to encourage the representativeness heuristic in his supporters. When judging whether an individual would make a good President, people might ask whether an individual who has no government experience, whose business career has involved 4 bankruptcies, and who seems uninterested in learning basic facts about government and public policy is likely to make a successful President. Or, they may ask themselves whether he has the personal characteristics that represent Presidential qualities. Through “The Apprentice” and his early speeches and interviews Trump convinced his supporters that he fit the image of a good leader. The Availability Heuristic. Daniel Kahneman (2011, pp. 129-145) discusses a heuristic that can exacerbate the effects of the representativeness heuristic on the way we judge the frequency of events and how probable they are to occur in the future. If, for example, we are asked how many terrorist acts occured in the United States last year we will search our memories. If a great many examples are available in memory, we will judge that there have been a great many terrorist acts. Our memories, however, are affected by the vividness of the attacks, how they are covered in the media, and other factors that may cause us to remember them more readily which will increase our estimate of their frequency (Tversky & Kahneman, 1973, 1974; Schwenk, 1985 1986). This heuristic has been shown to affect financial decision-making (Kliger & Kudryavtsev, 2010), ethical decision-making (Hayibor & Wasieleski, 2008), and interpretations of social situations (Riddle, 2010). When Trump supporters considered whether Trump or Clinton would make a good President they may have asked themselves how many times they could remember each one behaving in ways that were impressive and Presidential. As will be demonstrated in the discussion of Stage 2, the news media gave more coverage to Trump than Clinton. For this reason, and because his words were often startling and vivid, supporters may have had more such memories of him than they had of Clinton. This may be one of the reasons they clung to their view that he should run our country. Political Processes: Republican Primaries. The Republican primaries should have been the place where Trump’s past misstatements, character flaws and lack of qualifications for the office were brought to light by his opponents. Trump University, Trump’s 9/11 Celebration claims, his 4 bankruptcies, and his misstatements about his own wealth and his own past business acumen should have been brought up repeatedly and aggressively by his opponents. Several of Trump’s opponents criticized his false statements about thousands of Americans cheering the collapse of the twin towers on 9/11 but the issue seemed to fade away as the debates progressed. One opponent, Ben Carson, said that Trump was correct and that he had also seen the news footage of the cheering mob. Dr. Carson was recently appointed by President Trump to the post of Director of the Department of Housing and Urban Development. In general, Trump’s opponents seemed to go easy on him. Why did the other Republican candidates fail to attack Trump on problems that might potentially disqualify him? One possible explanation is that they did not take him seriously and no one wanted to be the first to go after him and incur his wrath. Also, Republican opponents may have felt reluctant to criticize him for things some of their own donors might also be doing. More importantly, they may have already known that Trump supporters would not care. His supporters embraced him and when they did, no amount of information about his honesty, competence, or his unbelievable assertions could change their minds. One candidate, Marco Rubio, did forcefully and aggressively draw attention to the fraudulent Trump University in the February 25, 2016 Republican Primary debate in Houston, Texas. Rubio also publicly criticized Trump for his falsehoods about his past financial success, citing his 4 bankruptcies which Trump has absurdly claimed are further evidence of his business acumen. This strategy did not seem to help Rubio, who withdrew from the presidential race on March 15, 2016 after losing his home state of Florida to Trump. Trump Rallies. Trump’s rallies served two important functions. First, they allowed the candidate to shape and polish his message and his manner of delivering it. Based on audience reactions, he learned which slogans seemed to resonate most with his supporters. For example, the phrase, “Drain the Swamp” proved to be very successful though Mr. Trump has said that early on he did not think it had much promise. Second, attending rallies involved making a public display of commitment to the candidate. Public displays or public statements in favor of a candidate, party, or policy increase our mental commitment to them. This topic will be discussed in more detail under the heading of escalating commitment. Organizational Processes: Media Coverage. Throughout the Republican primaries, Trump received more media coverage than any of his challengers. An analysis of election reporting from January 1 to June 7, 2016 in eight major news outlets—CBS, Fox, the Los Angeles Times, NBC, The New York Timeshowed that Trump received more coverage than any of the other Republican candidates in every one of the 24 weeks in that period. He also received more coverage than Hillary Clinton and Bernie Sanders in 23 of those 24 weeks (Patterson, 2016). Patterson, the author of this report, took the news organizations to task for covering the primaries like a sporting event, with a focus on who was winning or losing and little attention to the candidates’ positions on issues and their understanding of the issues or lack thereof. The news media spent more time on Trump than other candidates but not because reporters, editors, and broadcasters wanted Trump to win. Rather, it was because his performances and statements were extreme, flamboyant, and entertaining. Covering him increased readership and ratings. Cognitive Processes: Identification. As the Republican Primary race progressed, Trump supporters became more strongly identified with him and this made the polarizing conflict between them and the supporters of other candidates worse. They invested themselves in their support of Trump and it became part of their identities. In order to explain this it is necessary to discuss the development of the self, identities, and identification. What I call my “self” is a schema, a mental construct, a way of thinking that provides a framework for interpreting events and making decisions. A schema is a cognitive structure through which we frame experience. We understand and enact our selves through what is called the self-schema (Leary, 2007; Leary & Tangney, 2003; Schwartz, Luyckx & Vignioles, 2011). The self-schema is composed of multiple identities, each one corresponding to a social role such as parent, employee, or citizen. These identities are evoked by the decisions we face in our daily lives. Making decisions and commitments further defines and shapes identities and the relationships between them. Social identification is a form of psychological attachment that occurs when members adopt the defining characteristics of the social group as defining characteristics for themselves (Dutton et. al., 1994). We enact our “selves” by assuming different roles within social groups and arranging these hierarchically (Tajfel, 1974, Tajfel & Turner, 1986). As individuals continue to engage in behaviors demanded by the social or political group, their social identities are evoked and their identification with the views of the social group increases. Individuals define and differentiate their social identities by contrasting themselves and their group with opposing groups. Unfortunately, this reinforces the process of polarizing conflict between those identified with different groups (Hogg & Terry, 2000). The more we identify with a group or point of view, the more our self-schema is dominated by our group identity. A single, strongly held identity may strengthen a persons' self-concept (Dutton et al. 1994) but strong identification may also create serious problems. It may lead to an excessive commitment to the group that weakens a person’s other social identities, as well as unethical behavior on behalf of the group, and an attempt to suppress diversity of views (Dukerich et al. 1998; Kunda, 1992; Schwenk, 1997). Strong identification may cause people to narrow their range of vision by focusing on particular values, particular knowledge, and particular alternatives that do not threaten their image of the communities to which they belong (Gioia & Thomas, 1996, Simon, 1945). Individuals who become too strongly identified with a political party or candidate distort information and social feedback to preserve their own self-esteem, which is intimately connected with their social identity (Mischel & Morf, 2005, p. 30). When this happens, individuals are more likely to fall prey to the cognitive biases discussed in the remainder of this section and in the next section of the paper. Diagnosis of problems will be restricted (Weick, 1995), biased views and assumptions will not be questioned, and people will be less effective decision-makers (Janis, 1982). Confirmation bias. A common mistake in reasoning involves the way people test their opinions and beliefs. The right way is to look for disconfirming information, which will allow us to abandon or change our opinions if they are wrong. On the other hand, if we are motivated to cling to our prior beliefs, we will search for confirming information, information that will reassure us that we did not make a foolish mistake in choosing these beliefs (Klayman & Ha, 1987; Ross & Anderson, 1982; Stanovich, West & Toplak, 2013). If we are strongly identified with a particular political view or candidate we will be more motivated to confirm our judgment. Donald Trump’s supporters searched for information and anecdotes that would confirm their views of his competence and sincerity and resisted information that challenged their prior beliefs. In other words, their original judgment became an anchor and they assimilated new information in a biased way. Anchoring. When we are presented with information on a topic and later make a judgment about the topic, the prior information acts as a kind of cognitive anchor. When we receive new information, we give it less weight and do not revise our judgments as much as we should (Kahneman, 2011, pp. 119-136; Schwenk, 1988, 2002; Simmons, LeBoeuf & Nelson, 2010; Tversky & Kahneman, 1974). This effect should be stronger if we are identified with and emotionally committed to our original judgment. For example, Trump supporters continued to support him and minimize or ignore new information on his integrity and competence. Biased Assimilation. The anchoring bias leads us to undervalue new information but when we do pay attention to it and assimilate it we do so in a biased way. Lord, Ross & Leper (1979) showed that we assimilate new information that is consistent with our own previous judgments and beliefs more readily than inconsistent information. When we are strongly identified with these beliefs and our identities are threatened by inconsistent information, biased assimilation becomes more pervasive in our thinking (Kahan, 2010; Kahan, Slovic, Braman, Cohen & Gastil, 2010; Kahan, Peters, Wittlin, Slovic, Ouellette, Braman & Mandel, 2012). Kahan and his colleagues have shown that biased assimilation is involved in resistance to and denial of scientific facts, as well as interpretation of evidence in legal contexts. Once Trump’s supporters began to identify with him they selectively processed or ignored information about his flaws. Eventually, this would lead to backfire effect in response to fact checking of Trump’s misstatements. Stereotyping. It is obvious that people in conflict tend to stereotype their opponents but they also tend to turn themselves into stereotypes by adopting increasingly extreme views. When this happens, people become entrapped in escalating conflicts. Stereotyping opponents often involves ascribing extreme views to them. Research conducted over the past half-century provides more detailed information on how this process works (Allport, 1954; Gilovich, Griffin, & Kahneman, 2002; Fiske & Lee, 2008; Stroessner & Plaks, 2001; Tajfel, 1981). On topics ranging from workplace sexual harassment to abortion to race relations, those committed to each side overestimated the extent to which they disagreed with those in the opposing group. They also overestimated the similarity between the views of those on their own side. Why? Part of the answer has to do with how we behave in groups. If our group is involved in conflict with another, there is often social pressure on members who do not share the majority view to remain silent. This is part of the process the psychologist Irving Janis called groupthink, which will be discussed later in the paper (Janis, 1982). When members do speak, they are unlikely to fully express the ambiguities in their feelings and perceptions. This creates a false sense of consensus within a group. Members then tend to assume that opposing groups are also nearly unanimous in their views. Both Trump supporters and opponents engaged in stereotyping. Interestingly, we recognize stereotyping more readily when others do it than when we do it. Many Trump supporters know that Hillary Clinton stereotyped them when she said that half of them were in “a basket of deplorables.” However, Trump’s dozens of memorable stereotypes, including his statement that reporters in the “liberal media” are “the most dishonest people on the face of the earth” were regarded not as stereotypes but as simple statements of the truth. Political Processes: Russian Cyber-espionage. Hacking and selective information dissemination conducted by Russians probably played a role in the election outcome. Since it appears to have been in service of the political agenda of Vladimir Putin, the author has chosen to discuss it as a part of the Political Processes model. Though Putin’s staff conducted cyber-spying throughout the election campaign, it became more important and damaging toward the end when Wikileaks released the Clinton e-mails which Putin’s team had provided to them. Generally, information collected through any type of espionage is kept secret to avoid tipping off the target and to allow for the collection of further information. Putin decided to release information that would draw attention to Russia’s cyber-espionage program in order to cut Hillary Clinton’s victory margin and because there was nothing in the information that he could be used against her at a later date. The Clinton e-mail dump provided a huge amount of information which allowed those already committed to Trump to find more information to confirm their distrust of Clinton (confirmation bias). The information allowed them to establish more examples in memory of Clinton’s flaws (availability bias). This, in turn, allowed them to discount Trump’s statements and actions showing he was unfit to be President and thereby reducing their cognitive dissonance (dissonance reduction will be discussed later). Claims made about the content of the stolen e-mails by Fox news intensified the effects of these cognitive heuristics and processes. Organizational Processes: The Electoral College. Though the Electoral College is a political institution, it should be discussed under organizational processes because it is basically a mechanism for aggregating the preferences of states into a single vote for President. The intent of the writers of the Constitution was that the Electors would be chosen by state legislatures and that they would actually exercise independent judgment is selecting the President. The Founders certainly did not want to favor any particular candidate or party. The states soon began to link the popular vote to the Electoral College votes and the Electors simply followed the will of the people of the states. All but two states adopted “winner take all” rules in order to maximize the impact of their states’ contributions to the Electoral College vote. As we all know, this system can produce the unintended consequence of awarding the Presidency to the candidate who receives fewer votes. Media Coverage.Based on an analysis of approximately 20,000 news articles written from July, 2015 to July, 2016 that mentioned Trump or Clinton but not both, Beckwith & Sorcher (2016) demonstrated that Donald Trump was the subject of nearly twice as many articles as Clinton. Trump’s advantage continued to grow over time. Many of the articles about Trump were negative but this negativity may have produced backfire effects that actually made his supporters more positive about him. Backfire effects will be discussed in more detail in the section on Stage 3. Trump’s advantage was slightly greater in television coverage, specifically minutes of screen time on the nightly news broadcasts of ABC, CBS and NBC. According to the Tyndall Report, which tracks news reporting in presidential campaigns, Trump received 1144 minutes while Clinton received 506 minutes (Tyndal Report, 2016). The media coverage of the Trump-Clinton contest followed the same pattern as the coverage during the primaries. But this was not because of a conspiracy among reporters, editors, and broadcasters to elect Trump. His performances and statements became increasingly extreme, flamboyant, and entertaining to some while being frightening to others. The news organizations were rewarded in terms of increased readership and ratings when they reported on his antics. Cognitive Processes: Escalating Commitment.Some decisions involve making an initial investment of money, time, or our reputations followed by later commitments. People sometimes receive feedback indicating that their chosen course of action is failing but they persist in “throwing good money (or other resources) after bad.” This is escalating commitment. When faced with increasingly negative outcomes from some decision or investment, they continue the same behavior rather than alter course. This process was first described by Staw (1976) and subsequent research has identified some of the reasons why individuals, organizations and nations sometimes commit large amounts of resources to failing courses of action (Brockner, 1992; Duhaime & Schwenk, 1985; Schwenk, 1984 & 1986; Sleesman, Conlon, McNamara & Miles, 2012 ; Staw, 1997). Brockner (1992) makes clear that people may commit more than just money to a course of action. They can also commit their identities and their reputations. They are more likely to do this if they have made public statements of their commitment, as Trump supporters did by attending his rallies. Some Trump supporters showed evidence of this process as the campaign continued. They identified with him, and once they did, their support for him became part of their own sense of themselves and the way they framed the world. Thus, their commitment became stronger and stronger until it was unshakable. Dissonance Reduction. Cognitive dissonance is a painful state of mind experienced by people who hold contradictory ideas or beliefs or who are given new information that contradicts one of theirbeliefs. The concept was first proposed by Festinger (1957) and has become a pivotal theory in social psychology (Cooper, 2007). People seek cognitive balance; that is, they attempt to make their ideas consistent with one another. If people are motivated to defend rather than change their original decision there are a number of cognitive techniques or tricks they can use to reduce dissonance by discounting information inconsistent with it (Fried & Aronson, 1995; Lee & Schwarz, 2010). One cognitive trick Trump supporters used was to disparage, denigrate, and revile the alternative choice. Once they had made the decision that he should be President, some of his statements and behavior may have raised questions in their minds about his fitness for the job, which would have created uncomfortable dissonance. The response of some supporters was to increase their distrust and dislike of Clinton. Anecdotal evidence from Trump supporters’ chants of “Lock Her Up!” and occasionally “Execute Her!” at his later rallies provide some support for this claim though it has not yet been systematically investigated. Backfire Effects. Backfire effects are one manifestation of the phenomenon of biased assimilation, which was discussed earlier. These effects also intensify the anchoring bias and escalating commitment. Once Trump supporters became committed to him, they attended to information that fit their prior views and resisted information that did not. They did not simply ignore the views of their opponents but cognitively fought against them. Thus, giving them facts that were inconsistent with their misconceptions merely strengthened those misconceptions. Nyhan & Reifler call this the “backfire effect” and their research investigates the processes by which it operates, the factors that affect it, and the role it plays in intensifying polarized views on public policy questions (Nyhan & Reifler, 2010, 2017). Nyhan and Reifler’s work does not show that everyone or even most people are subject to backfire effects. Rather, they occur in the most deeply committed partisans who are strongly motivated to actively resist information inconsistent with their beliefs. Cognitive processes like engaging in mental counter-arguments, intentional misrepresentation of opponents’ views, and denigration of opponents and the authorities they cite produced backfire effects and served to make Trump supporters even more committed to their views. Trump supporters who were already strongly committed to him were more likely to engage in these thought processes because they viewed negative information on their candidate as a personal attack on them. Groupthink. Groupthink is a shared mind-set that sometimes develops among people who have similar views in work groups or social groups. Groups that work together sometimes become very cohesive and committed to each other over time. When others challenge their views they “close ranks” or turn inward. They come to believe that the group is always right and that dissenters should be suppressed. Over time, these symptoms of groupthink become more severe and people cease to express dissenting views and attempt to protect the group from information that challenges its assumptions (Janis, 1982; Park, 1990; Schwenk, 1984, 1986, 2002; Turner & Pratkanis, 1998a & b). Baron (2005) has discussed the prevalence of groupthink in polarized groups. Partisans must not only oppose their enemies but also those within their own group or organization who question the group’s world view. As polarizing conflict intensifies, internal pressures in each group reduce the diversity of views within the group. As opposing groups become more different from each other, each group’s members develop views that are more similar and more simplistic. According to Janis (1982), stereotyping of rivals is a part of the groupthink process. Groupthink can develop into "group mindlessness." In mindless groups, dissenters become scapegoats whose presence and dissenting comments allow the group to reinforce its unquestioned perceptions and assumptions (Janis, 1982, p. 39). This mindlessness can lead to entrapment in escalating conflicts. Sadly, those suffering from groupthink are often blind to their affliction. Even more sadly, leaders often encourage groupthink in the mistaken belief that it is part of strong leadership. They believe that if all their subordinates share the same views, they will work more effectively together to implement their leader’s vision. This may be true if the subordinates are working on familiar problems in a stable environment. When new ideas are needed to deal with new problems or opportunities, however, such strong leaders will not be able to get them from subordinates who think alike and share the same assumptions. One of the symptoms of groupthink identified by Janis is the illusion of unanimity, which is similar to the false consensus effect. It seems both Trump supporters and opponents were victims of groupthink. Trump supporters’ defensive reactions to negative information about him and their stereotyping of rivals suggest groupthink. Trump opponents may have fallen prey to groupthink in their predictions that he would lose the election. Sean Trende, in an article entitled, “Trump and the punditry’s scary groupthink” observed the fact that some people seemed hostile to information suggesting that Trump might have a chance of winning. What makes Trende’s article impressive is that it was not written after the election but five months before it (Trende, S. June 9, 2016). It may be that political polarization encourages groupthink on both sides. The intensely polarized political environment in which the election occurred caused the Trump and Clinton supporters to process information in radically different ways. Republicans and Democrats responded differently to the 2008-2009 financial crisis and the Great Recession, though both sides felt the political establishment had let them down in the way it responded to the crisis. Trump successfully created a negative frame for America and a positive frame for himself. By repeatedly stressing his skill as a business strategist, he encouraged his supporters to use the representativeness and availability heuristics which lead them to become increasingly confident that he was the best choice for President. Trump’s rallies allowed him to continue to provide self-serving information and misinformation. They also helped his supporters to identify with him and become more committed to his candidacy. Trump received more media coverage than Clinton. Therefore, his supporters had more information they could use selectively to confirm their view that he should be the next President. The confirmation bias helped them to anchor on their original judgments and assimilate new information in a biased way. Part of this biased assimilation involved denigrating and stereotyping opponents and their views. Russian agents had been conducting cyber-espionage throughout the campaign but toward the end they arranged the release of some of this information to weaken Clinton’s candidacy. This information plus the false news stories they spread contributed to Clinton’s defeat but we do not yet know how significant their contribution was. The over-representation of Trump supporters in the electoral college allowed him to win despite the fact that Clinton received 2.8 million more votes than he did. During the last phase of the election, Trump supporters’ commitment to him escalated. They responded to negative information about him by strengthening their prior beliefs (backfire effects) and by forming ever more negative views of Clinton (dissonance reduction). Groups of supporters developed an unassailable belief in their rightness and a suspicion of dissent (groupthink). There are a variety of approaches to help people reduce the impact of biases. One technique designed to help people examine their assumptions and re-think their decisions is called devil’s advocacy (Cosier, 1981; Mason & Mitroff, 1981; Schweiger, Sandberg & Ragan, 1986; Schwenk, 1984b, 1988, 1990, 2002). Everyone has heard the phrase, “let me play devil’s advocate.” Unfortunately, people who assume this role to improve decisions seldom play the role properly. They generally propose an alternative plan or decision. This leads people to think they need to choose between the original plan and the alternative or counter plan. The correct way to play the devil’s advocate role is to identify the assumptions on which the favored decision or plan rests and question those assumptions. They should encourage others to think of a new plan that is superior to both the plan and counter plan. If this approach is used properly, it does not lead to polarized debate which can produce backfire effects, exacerbate defensive processing, and intensify groupthink. When we act as devil’s advocates, question our own assumptions, understand the other person’s worldview, and work with them to find a better understanding of the problem, this will reduce polarization and improve collective decisions. Unfortunately, devil’s advocacy and other decision-making techniques only work if people have intellectual humility, are willing to tolerate uncertainty, and willing to spend more effort on their decisions. At the present time, Trump supporters do not have these prerequisites. It may be necessary for them to endure Trump’s misrule until they recognize the need take greater care in electing a President, which is, after all, one of the most important duties we have as citizens. Another possible approach is suggested by behavioral economist Richard Thaler and Cass Sunstein in a book called Nudge (Thaler & Sunstein, 2008). They suggest that our knowledge of cognitive biases can be used to essentially bias peoples’ decisions in a positive way. In a number of areas such as reducing smoking, promoting more saving, and reducing energy consumption, they give specific suggestions for how governments might frame information and choices to encourage people to behave more wisely. Thaler and Sunstein acknowledge that people are suspicious of government managing peoples’ choices. They worry that it may lead to what Tocqueville called, “soft despotism.” Tocqueville saw this as a form of social control that, “does not break men’s will, but softens, bends, and guides it; it seldom enjoins, but often inhibits action; it does not destroy anything, but prevents much from being born; it is not at all tyrannical, but it hinders, restrains, enervates, stifles, and stultifies….” (Tocqueville, 1835/1969, p. 692). However, Tocqueville made clear that the purpose of this kind of despotism is to make people childlike and obedient. This is definitely not the purpose of the recommendations in Nudge. They have the opposite objective, to make people more mature in their judgments and more able to act like adults in making life decisions, including decisions about their political leaders. Regrettably, Trump supporters seemed to actively resist all negative information about their candidate regardless of how it was presented. If people are determined to misuse information and make poor decisions, attempts to improve their decisions may be seen as coercion. It seems essential to better understand Trump supporters’ strong determination to mentally bolster their choice rather than to objectively examine it. Future research may provide a basis for suggestions to help them discharge their civic duty in a more thoughtful fashion. Future Research.In this paper, 12 cognitive processes, heuristics and biases that may have influenced the Trump election have been discussed. There are many additional heuristics and biases that may be relevant to the decisions of the 62,000,000 people who voted for him. These should be explored in future conceptual pieces. The biases discussed in this paper should have had their strongest effect on the most committed Trump supporters. Future research should focus on those who remain loyal to Trump in the future. From this group researchers should select those who were committed to him from the beginning of his campaign. This is the group from which we may be able to learn the most about how Trump became President and how to avoid similar collective decision errors in the future. It is important that we understand this serious error in collective judgment. If we can’t choose better presidents, we can’t have our democracy anymore. Abramowitz, A. & Webster, S. (2016) The rise of negative partisanship and the nationalization of U. S. elections in the 21st Century. Electoral Studies, 41: 12-22. Allison, G. (1971) The Essence of Decision: Explaining the Cuban Missile Crisis. New York: Little, Brown. Allport, G. ( 1954) The Nature of Prejudice , p. 189. Baron, R. (2005) So right it's wrong: Groupthink and the ubiquitous nature of polarized group decision making. Advances in Experimental Social Psychology. 37 : 35. Bateman, T. and Schwenk, C. (1987) Bias in investor decision-making: The case of John DeLorean." Mid-American Journal of Business, 1, 5-11. Brockner, J. (1992). The escalation of commitment to a failing course of action: toward theoretical progress . Academy of Management Review 17 : 39–61. Coleman, P. & Lowe, J. (2007) Conflict, identity, and resilience: Negotiating collective identities within the Israeli and Palestinian diasporas. , 24(4), 377-412.
Cooper, J. (2007) Cognitive Dissonance: 50 Years of a Classic Theory. London: Sage Publications. Cosier, R. (1981) The dialectic in strategic planning: A case of premature acceptance? Academy of Management Review. 6: 643-648. Druckman, J. (2001) Evaluating framing effects . Journal of Economic Psychology, 22: 96–101. Duhaime, I. & Schwenk, C. (1985) Cognitive simplification processes in acquisition and divestment decision?making. Academy of Management Review. 5: 287?295. Dukerich, J., Kramer, R., and Parkes, J. (1998) The dark side of organizational identification. In D. Whetten and D. Godfrey (Eds.) Identity in Organizations. Thousand Oaks, CA. : Sage. Dutton, J., Dukerich, J. & Harquail, C. (1994) Organizational images and member identification. Administrative Science Quarterly, 39: 239-263. Fiske, S. & Lee, T. (2008) S tereotypes and prejudice create workplace discrimination . In Brief, A. Diversity at Work. New York: Cambridge University Press. pp. 13–52. Fried, C. & Aronson, E. (1995) Hypocrisy, misattribution, and dissonance reduction. Personality and 21 : 925–933. Gilovich, T., Griffin, D. & Kahneman, D. (2002) Heuristics and Biases: The Psychology of Intuitive Judgment. Cambridge, England: Cambridge University Press, pp. 651-653. Gioia, D. and Thomas, J. (1996) Identity, image, and issue interpretation: Sensemaking during strategic change in academia. Administrative Science Quarterly, 41: 370-403. Hayibor, S. & Wasieleski, D. (2008) Effects of the use of the availability heuristic on ethical decision- making in organizations. Journal of Business Ethics : 151–165. Hogg, M. and Terry, D. (2000) Social identity and self-categorization processes in organizational contexts. Academy of Management Review, 25: 121-140. Janis, I. (1982) Groupthink: Psychological Studies of Policy Decisions and Fiascoes. 2nd ed. Boston: Houghton Mifflin. Kahan, D. (2010) Fixing the communications failure. Nature : 296–297. Kahan, D., Slovic, P., Braman, D., Cohen, G. & Gastil, J. (2009) Cultural cognition of the risks and benefits of nanotechnology. 4 : 87–90. Kahan, D., Peters, E., Wittlin, M., Slovic, P., Ouellette, L., Braman, D. & Mandel, G. (2012) The polarizing impact of science literacy and numeracy on perceived climate change risks. Nature: Climate Change 2 : 732–735. Kahneman, D. (2011) Thinking, Fast and Slow. New York: Farrar, Straus, & Giroux. Kahneman, D. & Tversky, A. (1972) Subjective probability: A judgment of representativeness. Cognitive Psychology. 3: 430–454. Klayman, J. & Ha, Y . (1987) Confirmation, disconfirmation and information in hypothesis testing 94: 211–28. Kliger, D. & Kudryavtsev, A. (2010) The availability heuristic and investors' reaction to company-specific events. Journal of Behavioral Finance 50–65. Koehler, J. (1996) The base rate fallacy reconsidered: Descriptive, normative, and methodological challenges. Behavioral and Brain Sciences. : 1–17. The Curse of the Self: Self-Awarenes, Egotism and the Quality of Human Life . Oxford: Oxford University Press. Leary, M. & Tangney, J. (2003) Handbook of Self and Identity, New York: Guilford Press. Lord, C., Ross, L. & Lepper, M. (1979) Biased assimilation and attitude polarization: The effects of prior theories on subsequently considered evidence. Journal of Personality and Social Psychology. 37: 2098-2109. Mann, T. & Ornstein, N. (2006) The Broken Branch: How Congress is Failing America and How to Get It Back. Oxford, Oxford University Press. Mason, R. & Mitroff, I. (1981) Challenging Strategic Planning Assumptions: Theory, Cases, and New York: Wiley. Myers, D. & Lamm, H. (1976) The group polarization phenomenon. Psychological Bulletin , 83 : 602– 627. Obedience to Authority: An Experimental View, New York: Harper & Row. Nichols, A. & Maner, J (2008) The good subject effect: Investigating participant demand characteristics. Journal of General Psychology . 135: 151-165. Nisbett, R. & Ross, L. (1980) . Human Inference: Strategies and Shortcomings of Social Judgment. New York: Prentice-Hall. pp. 115–118. Nyhan, B. & Reifler, J. (2010) When corrections fail: The persistence of political misperceptions. : 32: 303-330. A review of research on Groupthink . Journal of Behavioral Decision Making : 229– 245. Pratt, M. & Foreman, P. (2000) Clarifying managerial responses to multiple organizational identities. Academy of Management Review, 25: 18-42. Riddle, K. (2010) Always on my mind: Exploring how frequent, recent, and vivid television portrayals are used in the formation of social reality judgments. 13 : 155–179. Ross, L. & Anderson, C. (1982) Shortcomings in the attribution process: On the origins and maintenance of erroneous social assessments. In Kahneman, D.; Slovic, P. & Tversky, A. J udgment Under Uncertainty: Heuristics and Biases. Cambridge University Press, pp. 129–152. Schweiger, D., Sandburg, W. & Ragan, J. (1986) Group approaches for improving strategic decision making: A comparative analysis of dialectical inquiry, devil’s advocacy, and consensus. Academy of Management Journal. 29:149-159. Schwenk, C. (1984a) Cognitive simplification processes in strategic decision-making. Strategic Management Journal. 5: 111-128. Schwenk, C. (1984b) Effects of planning aids and presentation media on performance and affective responses in strategic decision?making. Management Science. 30: 263?272. Schwenk, C. (1986) Information, cognitive bias, and commitment to a course of action. Academy of Management Review, , 298-310. Schwenk, C. (1988) The Essence of Strategic Decision-Making. Lexington, Mass. : Lexington Books, 1988. Schwenk, C. (1990) Effects of devil's advocacy and dialectical inquiry on decision-making. Organizational Behavior and Human Decision Processes. 47: 161-176. Schwenk, C. (1997). The case for weaker leadership. Business Strategy Review, 8: 4-9. Identity, Learning and Decision-Making in Changing Organizations. New York: Quorum Books. Scott, S. & Lane, V. (2000) A stakeholder approach to organizational identity. Academy of Management Review, 25: 43-62. Simmons, J., LeBoeuf, R., & Nelson, L. (2010) The effect of accuracy motivation on anchoring and adjustment: Do people adjust from provided anchors? J ournal of Personality and Social . : 917–932. Simon, H. (1945) Administrative Behavior. New York: Free Press. Sleesman, D., Conlon, D., McNamara, G. & Miles, J. (2012) Cleaning up the Big Muddy: A meta-analytic review of the determinants of escalation of commitment. Academy of Management Journal. 55: 541–562. Stanovich, K., West, R. & Toplak, M. (August 5, 2013). Myside bias, rational thinking, and intelligence. Current Directions in Psychological Science. 22 : 259–64. Staw, B. (1976) Knee deep in the Big Muddy: A study of escalating commitment to a chosen course of action . Organizational Behavior and Human Performance 16: 27–44. Staw, B. (1997). The escalation of commitment: An update and appraisal. In Shapira, Z. Organizational Decision-Making. New York: Cambridge University Press. pp. 191–215. Stroessner, S. & Plaks, J. (2001) I llusory ccorrelation and stereotype formation: Tracing the arc of r esearch over a quarter century . In Moskowitz, G. Cognitive Social Psychology: The Princeton Mahwah, N.J.: Erlbaum, pp. 247– 259. Tajfel, H. (1974) Social identity and intergroup behavior. Social Sciences Information, 14: 101-118. Tajfel, H. (1981) Social stereotypes and social groups. In Turner, J. & Giles, H. I Oxford, England: Blackwell, pp. 144–167. Tajfel, H. & Turner, J. (1986) The social identity theory of intergroup behavior. In Worchel, S. and Austin, W. (Eds.) The Psychology of Intergroup Relations. Chicago: Nelson-Hall: 7-24. Nudge: Improving Decisions About Health, Wealth, and HappinessNew York: Penguin. Thaler, R., Tversky, A., Kahneman, D., & Schwartz, A. (1997) The effects of myopia and loss aversion on risk-taking: An experimental test. Quarterly Journal of Economics. 647-661. Tocqueville, A. (1835/1969) /Democracy in America. Translated by J. Mayer. New York: Harper & Row. Turner, M. & Pratkanis, A. (1998a) Twenty-five years of groupthink theory and research: Lessons from the evaluation of a theory. Organizational Behavior and Human Decision Processes. 73 : 105– 115. Turner, M. & Pratkanis, A. (1998b) A social identity maintenance model of groupthink. 73 : 210–235. Tversky, A. & Kahneman, D. (1973) Availability: A heuristic for judging frequency and probability. Cognitive Psychology . : 207–232. Tversky, A. & Kahneman, D. (1974) Judgment under uncertainty: Heuristics and biases. Science . 185: 1124-1131. Tversky, A. & Kahneman, D. (1981) "The Framing of decisions and the psychology of choice". Science . 211: 453–458. © Copyright 2019 Charles R. Schwenk. All rights reserved. Thanks! Some other readers felt I was way off base and that Trump is doing a very good job as President. It is nice to have positive comments. Way overcomplicated. Trump won for several reasons. Most people really are not in favor of forced purchase of Insurance, boys using girls bathrooms, Neither do most want socialism mentally ill transgendered leaders, historic statues taken down, Most are patriotic dont want open boarders In short dont want what has been shoved down their throats by liberals. They are sick of the Clintons and Hillary was overconfident and took her foot off the pedal at the end. Trump was not a mistake his election is exactly what we need and despite the media attacks is doing a darn good job. Good writing on the political scene. I am not into politics as some people are, but I do read about what's going on. The reason why Trump won has to do with many things. It has to do with he being an American has the chance, if he is in the position, to run for president. The planetary combinations has a lot to do with it as well. Trump wasn't born with the planet Saturn in the 10th house which places one in a high position. The planet Saturn came later on in his life which gave him the chance of holding a high position. Hitler was born with Saturn in the 10th house, and we all know what he did. Joan of Arc wasn't born with Saturn in the 10th house. This came later in her life, and we all know what she did. Thanks. I had not considered the astrological aspects of Trump's election. I certainly hope Trump leaves office as soon as possible but I hope he doesn't end up like Joan of Arc. I honestly don't want Trump to suffer. I just want him to stop making the rest of us suffer. I know what you mean. But I am afraid you'll have to wait until the above cycles pass. Just bear with it until then.